The Heritage Property Map is an interactive map, illustrating all of the Listed and Designated Properties in a particular city in Ontario. The map uses sources from OpenStreetMap, Google and a database of property information to link locations on the map to the pages in this wiki. The slider at the top right of the browser window allows you to change the view between the street map and the satellite image in a way that blends the two together. You can click and drag the slider button with the mouse pointer, and the view will gradually change between the street map and the satellite view. Dragging the slider button to the left will show more of the satellite image layer and less of the street map; conversely, dragging the slider button to the right will show more of the street map layer and less of the satellite image. You can click and drag the blue and white slider button on the left side of the browser window with the mouse pointer, and the view will gradually zoom in and out. Alternatively, you can use the middle scroll button on your mouse to zoom in and out. You can click on the blue and white arrows at the top left of the browser window to move the map north, south, east or west. Alternatively, you can click and hold the left mouse button on any part of the map and drag the map in any direction. The red map pins signify the location of a Designated Property; the blue map pins signify the location of a Listed Property. Clicking on a map pin will show an information box for that Property. 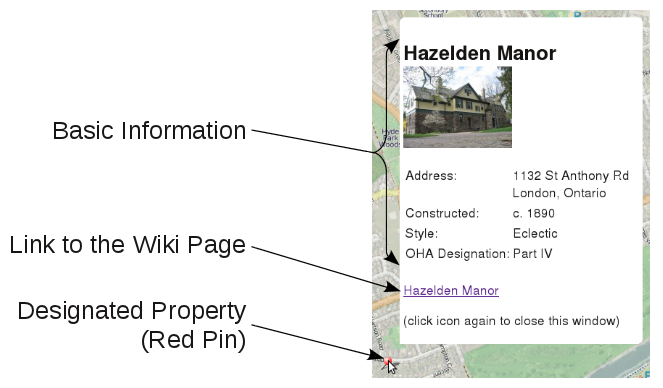 The information box contains basic Property Information, a picture (if available) and a link to the corresponding information page on this wiki. Clicking on a red or blue pin will show an information box for that Property. The information box contains basic Property Information, a picture (if available) and a link to the corresponding information page on this wiki. Clicking on the same pin will close this information box; clicking on a different pin will close the current information box and open a new one corresponding to the property represented by the different pin. Clicking anywhere on the map that is not on a map pin or a map control will show a dialog box containing the latitude and longitude of the mouse pointer.